There's impossible gallows in the right upper corner of the artwork. 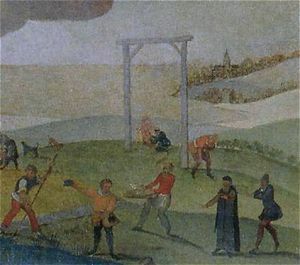 You can see enlarged part of the artwork with the gallows. Abel Grimmer (1570 - 1619) - flemish Baroque Era painter. His father Jacob Grimmer was also artist. He married Catharina Lescornet on 29 September 1591 and in 1592 became a master in the Antwerp Guild of St Luke. He is principally known for his numerous small paintings of country scenes, sometimes with a biblical theme, which often form part of a series of the Four Seasons or the Months of the Year. 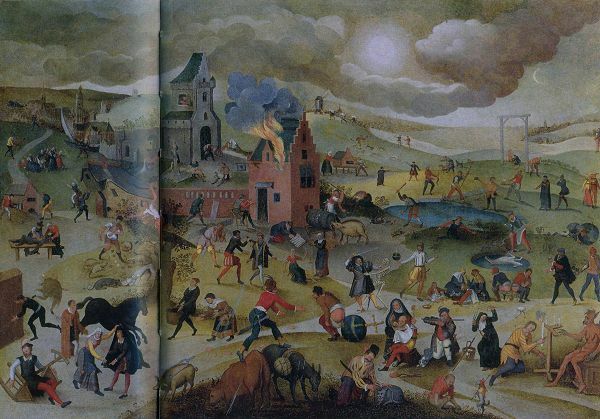 Some of these paintings were inspired by or even copied from prints by Pieter Bruegel I and Hans Bol, both of whose work strongly influenced Abel, even more so than did the example of his father’s work, which was also an important source of inspiration.